Abundance is the Universal desire for joy and inner peace. This peace may come from financial wealth, love, connection, life purpose or feeling fulfilled, joy, security, creativity or feeling spiritually fulfilled. Invite your deepest desire into your life and be receptive to receive it. The energy surrounding abundance is soft and receptive and there are elements of surrender but it is not passive. Be determined in your practice and let the energy flow. This guide is an extensive list of the elements and archetypes to create a home practice or ritual so you can manifest abundance. Mudras are hand gestures that help the flow of energy within your physical and emotional body. They are used in conjunction with yoga postures, mediations and breath to help stimulate the flow of energy to different parts of the body. This guidebook gives an overview of three Mudras as well as suggested posture and breath practice for each. 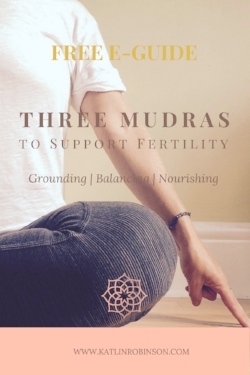 Each Mudra supports fertility in its own unique way. Each page of this guidebook includes the picture of a Mudra, its benefits, how to hold the Mudra, tips for when to practice and its overall energetic benefits. Mudras can be used in combination with breath practices, yoga and meditation or it can be helpful on it’s own. You can decide which to use based on your current mood and energy levels. If you don't have a yoga or meditation practice simply hold the Mudra and breath gently using an affirmation or simply repeating the overall benefit. For example "Today I am grounded".